London, UK – Education and literary experts constantly urge children to put down their video games and pick up a book, and this new children’s adventure novel encourages just that with its interactive heat-sensitive cover that dramatically changes when touched. 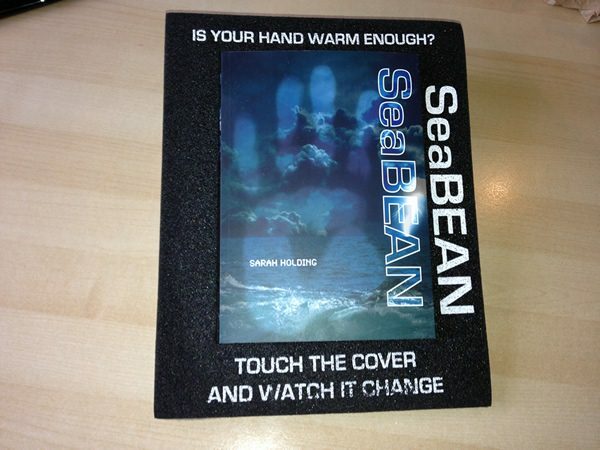 Sarah Holding is inviting the world to judge her book, SeaBEAN, by its cover. The mysteriously dark cover of the first book in the trilogy reveals a dramatic seascape image when touched or rubbed with a warm hand. As it cools however, the image disappears and the cover slowly reverts to its original darkness, evoking the interactive outer surface of the futuristic craft that features prominently in the novel. Although the cutting-edge technology of the cover is capturing the attention of critics around the world, young reviewers haven’t let the excitement distract them from the quality of the story and can’t wait forSeaWAR and SeaRISE, out early next year. The launch of SeaBEAN (23 Sept) at Foyles in London was an exciting affair and included the first performance of the specially-commissioned ‘St Kilda Suite’ for flute and piano. To coincide with the launch, special point-of-sale units were available to retailers to encourage customer interaction with the cover. Throughout the trilogy, Sarah Holding has subtly introduced educational aspects – including global environmental issues, navigation using longitude and latitude, time zones and the impact that even the most remote of sanctuaries can have beyond their shores. SeaWAR (Book 2) and SeaRISE (Book 3) will be available in early 2014.